Here’s your August update from Flip the Fleet. Around three quarters of you (79%) reckon that financial subsidies will be needed if at least half of new vehicle registrations are to be electric vehicles by 2025 – for the full story, click https://flipthefleet.org/2018/financial-incentives-to-accelerate-ev-uptake-1-click-survey-22/. You highlighted a key need to secure adequate supply of a wide variety of new EVs for New Zealand in the face of an escalating competition from bigger markets which are buoyed by tax breaks and direct subsidies. Our reliance on second-hand imports makes us vulnerable to inadequate supply and provides inadequate protection to importers, dealers and purchasers, because the manufacturers’ warranty is voided when the cars leave their country of origin. As the EV transition accelerates overseas, second hand ICVs may become all the cheaper and make it even harder to sell EVs in NZ unless financial incentives are in place. Feebates, adjustment of Fringe Benefit Tax and continuation of Road User charges and reduced ACC levies were your most popular ways to apply incentives. Some of you challenged the target itself, and called for a clear rationale for the way it was set. If necessary, the target should be adjusted to make sure that sufficient EVs are registered to reach our national climate change and zero carbon economy goals. A formal cost benefit analysis can then work out how much public money must be spent, and where it can be most effectively spent to ensure success. A media release about your opinions is posted at https://flipthefleet.org/2018/media-release-incentives-are-needed-to-achieve-ev-uptake-goals/. We will gradually shift our website over to these new standardisations as time allows. Our preliminary statistical models of average energy efficiency (km/kWh) from all the data you have provided show some interesting and logical patterns (Fig. 1). The most efficient model is the Hyundai Ioniq, probably partly because its aerodynamic design reduces the energy required to displace air as it travels along. The Nissan Leaf Gen 1.2 is around 10% more efficient than the Gen 1.1, presumably because it is lighter and has more efficient lights and heating systems. The eNV200 van is way less efficient, presumably because of its shape and perhaps because it is often loaded with goods or equipment. The big and hyper fast Teslas are the least efficient. 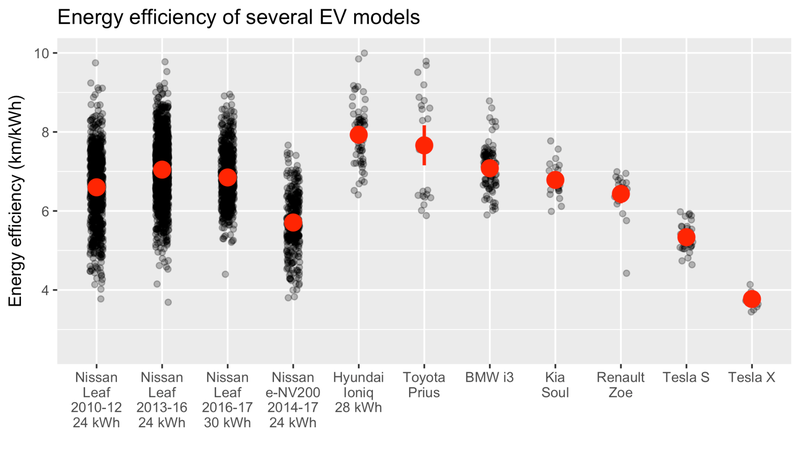 The graph also shows how we need a lot more data for all the less common models – really, we only have strong data for the Nissan models so far, and of course we want even more numbers from those models to delve deeper into seasonal and regional difference. Please encourage other EV owners to sign-up to Flip the Fleet. Figure 1: Energy efficiency (km/kWh) of different electric vehicles in New Zealand. The red dot is the mean efficiency, and the red bars show the 95% uncertainty band. It’s great news that Nissan NZ will make the 30 kWh battery firmware update available through its seven trained Leaf repairers (see https://flipthefleet.org/2018/nissan-makes-30-kwh-battery-firmware-updates-available-through-its-service-providers/). However, not all Gen 1.3 Leafs need the update and some of you live a long way from the nearest service agent. It would be a long journey only to discover that you didn’t need the fix. Daniel Myall prepared the following graph for you to check, assuming that you have access to the Hx and SoH values from LeafSpy for your car. 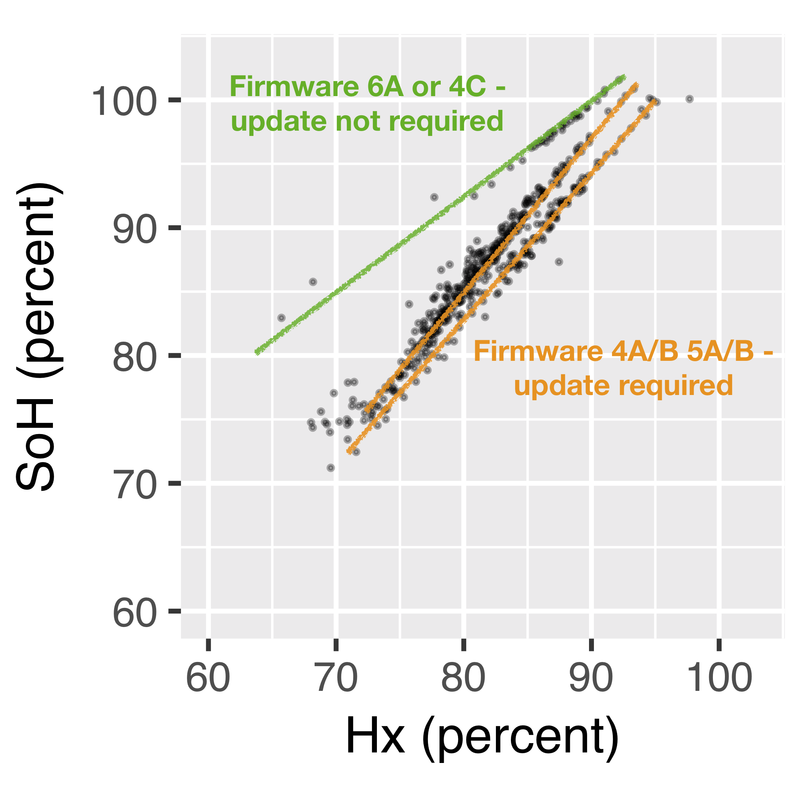 Look at where the relationship between your Hx and SoH falls on this plot – if it is near the green line then no update is required, if near an orange line, then the update applies. It’s easy to correct your data entries, go back to fill in a gap, or retrospectively load any historical data you have in notebooks and or spreadsheets. Just click on the ‘Add Data’ button and you’ll find the last month’s column open (the previous month’s column is to the right and greyed out – we provide it just for reference and to allow you to quickly check that the new month’s data make sense). Just over-write any figure for the last month that was an error, or fill in the gaps – when you click the blue “Submit data’ button at the bottom, the new and corrected data is saved in the database and the old junk wiped out. If you have historical data, just select the relevant month from the drop-down menu at the top middle column, and the past month’s fields open for your information. Of course if you have leafspy pro you can just read the ECU firmware version directly? I have a 24 Kw. Leaf Generation 1.2 (2015) and would like to know if there is a monitoring device I can purchase to track how much power it uses Cost/Kwh when I plug into our ordinary 10 Amp household circuit. The retirement village where I live has two caravan points but the management is charging $10.00/plugin, which is quite substantial so I have been using my household circuit to charge up my leaf. If I could compare costs I would have a better idea of what it is actually costing me. I have a meter that measures all the power used to charge our 1.2 Leaf, and I add in any kWh that we get from fast chargers. Over 12 months, electricity use has been consistently 18% higher than the indicated usage. For example, if the Leaf displays an average 7.0km per kWh, that equates to 14.3 kWh/100km (=100/7.0). Then actual electricity input will be 18% higher at 16.9 kWh per 100km. Alternatively, another observation is that while charging, 1.9kWh of electricity is used for each 10% increase of displayed state of charge. For example, to get from 30% to 80% uses 9.5kWh of power. The 1.9kWh/10% is always the same for home and fast charging for our 24kWh battery with 88%SOH, but will probably vary with different battery SOH. I intend joining flipthefleet when we have finalised our purchase of a 30kw Leaf. We are importing privately (have imported a car many years ago so understand risks and advantages) Very interested in member’s opinions on importance of SOH. Today for example our agent offered to bid on a 2016 X trim 30 kw, auction grade 4.5. Everything looked great in terms of trim but the battery was 10 bars.My understanding without being able to run the SOH software analysis is that this represents a SOH of somewhere between 72% and 78%. The mileage was 52,000km which is higher than I would like but I was more concerned about Battery and general condition than mileage. Am I being overly cautious? Any comments appreciated. Is it possible for you to ask your agent for a LeafSpy screenshot? If you get it, feel free to email it to us at wecan@flipthefleet.org and we’ll take a quick look. Perhaps, the software hasn’t been updated yet, which means the dash WILL show a reduced range and reduced SOH. Currently, this is easily corrected with a software update available through Nissan NZ once the car lands in NZ – so may be of no major concern. We can quickly calculate whether the software patch has been applied by looking at the LeafSpy screenshot.